The perfect place for your group event! 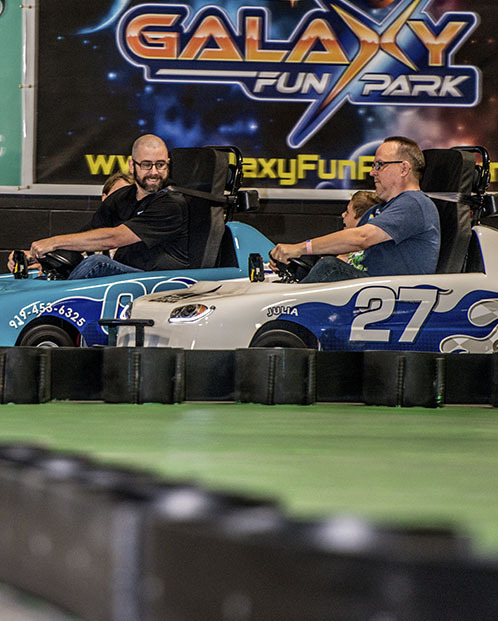 Galaxy Fun Park is the triangle's largest indoor family fun center with over 55,000 square feet of attractions that include trampolines, go-karts, laser tag, ropes course, spin zone, and a soft play area. We have 5 different private party areas, full cafe, and a beer and wine bar. Galaxy Fun Park is the place to bring your group from 15 to 1200 people. We offer unlimited play packages or we can cater a package that fits your budget and needs. Below are some events we can host but we are always up for a challenge if you have a new idea! We are in the business of fun and personal service. Galaxy Fun Park is lively and encourages creativity. We have attractions for all ages so come host your group event with us today! *In the event of inclement weather we do not offer refunds of deposits. We will rebook your Group Event no later than 30 days from your original date and move your deposit to that date.